Were you looking for the Sanctuary rune word from Diablo II? 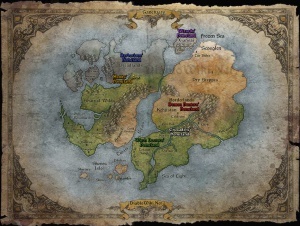 The World Map of Sanctuary. Sanctuary is the name of the physical realm of man in the Diablo Universe. It is not the only realm, but it is the world in which the Diablo games take place. Sanctuary was created as a plane of existence for the Nephalem, a race of omni-powerful beings birthed from renegade angels and demons who were tired of the war. The powerful demoness Lilith and the Archangel Inarius were the prime powers behind this, and their offspring were called Nephalem. The Nephalem could basically bend reality to their whims, significantly more powerful than demons or angels themselves. When the High Heavens and the Angiris Council found out about Sanctuary, they felt it was an abomination and designated Tyrael to take the Heavenly Host and destroy the entire world. The selfless sacrifice of Uldyssian to save Sanctuary changed Tyrael's mind, and in the end his was the weighing vote to leave Sanctuary unharmed. He was the last to vote and while both Auriel & Itherael voted for its existence and only Imperius had voted for destruction, had Tyrael voted with Imperius, it's most likely the world would have been destroyed on Imperius' insistence. The council wiped the memories of all humans, and none now know that Tyrael could have been the one responsible for the undoing of all of humanity. After the existence of Sanctuary was secured, Tyrael was ordered by his fellow angels on many occasions not to interfere with the mortal world. He has often disobeyed, fearing that Sanctuary would otherwise fall into the hands of the Burning Hells. When the Prime Evils were banished from hell during the Dark Exile, Tyrael helped humanity to create the Horadrim and the Soulstones they used to imprison Diablo, Mephisto and Baal, centuries before the events covered in Diablo I and Diablo II. You can also see the navigation at the bottom of this page for an easy pick. As most fantasy worlds, Sanctuary consists of cultures that shares different social traits. For now, the only thing that is known about these is that there is a mutual understanding of languages between the continents, and whether this is due to the fact that people speak multiple languages through their culture, of if there is a "common" language (English) that everyone shares is unknown. Players as well as characters and NPCs in the world travel to either side of the globe, and can still communicate with people. Names are more socially inspired though, and does show there must be some diversity with languages in the lands. Country names such as "Westmarch", and town names such as "Tristram", has a clear "Western" reference from our world, as does the architecture. Deckard Cain is a character name from a person of the west, while "Abd al-Hazir" is the name of a character from the flourishing East. If everyone shares a "common" language, they still seem to retain their own cultural names. The only known specifically mentioned language is the Umbaru people's tongue from the Teganze area of the Torajan jungles . Umbaru - Aboriginal/African/Haitian/Indian. There are some connections with an Aboriginal "King" who apparently was clairvoyant, and the name is similar to an Indian village, but there's also heavy inspiration from Haitian Voodoo culture. Xiansaian - Eastern Asian. Hard to know, since not much information about Xiansai is released, and the clothing seems to have both Chinese and Japanese inspiration. This is a list of known date names and numbers from the Sanctuary Calendar (really the Kehjistani calendar), based on journals made by Deckard Cain and Elder Aust of Harrogath in the years 1265-1266, during the war with the Prime Evils. From Cain's notes, it looks like months are about as long as our own world's, and they obviously have both their own month names as well as week day names. There are at least 10 months in the Kehjistani calendar (likely 12, mirroring our own calendar). There are at least 29 days in Jerharan, 28 days in Kathon and 27 in Damhar, indicating similar month length to our own earth. Kathon is most likely the first month in a year. Solmoneth is very likely the second month. Lycanum, Montath, Ostara, Vasan are middle months, not necessarily in that order, and also likely to be mixed in with two unknown months. Jerharan is very likely the fourth last month (9th, if 12 months total). Damhar is the third last month (10th). Ratham is the second last month (11th). Esunar is the last month (12th). At least some of these month names were inspired by names in the real world. "Ostara" is an old Germanic name for Easter, while "Damhair" is the Scottish Gaelic name for October, the tenth month. Worth noting is also the similarity with Nephalem names: Bul-Kathos (Kathon), Rathma (Ratham), Esu (Esunar), Vasily (Vasan). Perhaps the months, or some of them are named after the Nephalem? There may be other named hours in the day, or times might be given in forms like "An hour past Lauds" or "Halfway from Lauds to Sext". The names of the hours, like the general pattern of angelic names and a few other details of the world of Sanctuary, bear striking similarity to elements of Judeochristian religion on Earth but do not quite match under detailed scrutiny. Worth noting is that these two sources would be more or less compatible if it were not for the fact that Aust is talking about events in 1265 and Deckard Cain talks about 1266. As Deckard Cain's Journal is more recently released from Blizzard, it's probably safe to say that this is the canon lore. Mind the fact Blizzard has said there are discrepancies, and the latest stuff is the material we should believe. The only reoccurring event known at this time about sanctuary is the mysterious Night of Souls. The Aranoch desert on the western continent has a very similar name to another great desert in the Dungeons & Dragons fantasy setting, the Forgotten Realms: Anauroch. Seeing how many Blizzard employees have spent time in the D&D worlds, it's likely the name was inspired by the Anauroch desert, or perhaps a tribute to the great desert of the Forgotten Realms. This page was last edited on 7 January 2012, at 14:49.